God Grew Tired of Us puts a face on the victims of the 20-year civil war in the Sudan, which has been overlooked as an international cause celebré until recently. Among other atrocities inflicted on the peoples of the southern Sudan, was a decree to annihilate young males, setting-up a huge exodus of boys, 25,000 of them, who left their families and wandered en masse for five years, over a thousand miles and two neighboring countries, looking for shelter. At a UN refugee camp in Kakuma, Kenya, their journey came, if not an end, to a resting place. It was in Kakuma that filmmakers Christopher Quinn and Tommy Walker began a project documenting the immigration of some 3800 of these “Lost Boys” to the US. Three of the Africans, John Bul Dau, Daniel Abol Pach and Panther Blor settled in Pittsburgh and Rochester, New York. 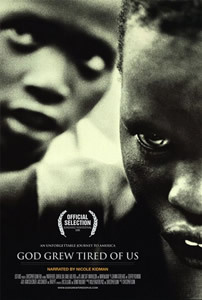 The film follows the first few years of their lives in America. As a documentary, God Grew Tired of Us offers the kind of silver-lining story Americans love. Is that irresponsible? Back in Africa, there was a different story– 1.9 million who lost their lives and 4 million who became homeless. This is the story of 3 lucky survivors who made their way to America, found jobs as bus-boys and vegetable stockers, and slowly began to adjust to life in a different culture. After all, who wants to watch a movie about 1.9 million people who get slaughtered and/or starve to death? God Grew Tired of Us does succeed as a character study, because the young men at the center of the documentary are big-hearted, sweet. These are three determined young men, leaders who overcame so many obstacles to get to the U.S. in the first place, they weren’t about to screw it up later. It is in the moments of cultural collision—a young man’s giraffe-like tongue sensing one first potato chip, a mother collapsing into tribal cries of joy upon reuniting with her son in an American airport—which create cinematic treasure. The film is important as a historical document, a reminder of a horrible passage by an entire generation of Southern Sudanese boys. But as a documentary, it deflates upon arriving in the vast, familiar blandness we know as America.